The Grill. Casa Julián de Tolosa. The pillars on which Casa Julián is based are the tools and the grilling techniques. Both are included in the Grill in capital letters, resulting in a unique gastronomic offer based on the study and learning of the behavior of fire. The grill entails the domestication of fire, a way of limiting its calorific power and putting it at the service of human feeding. 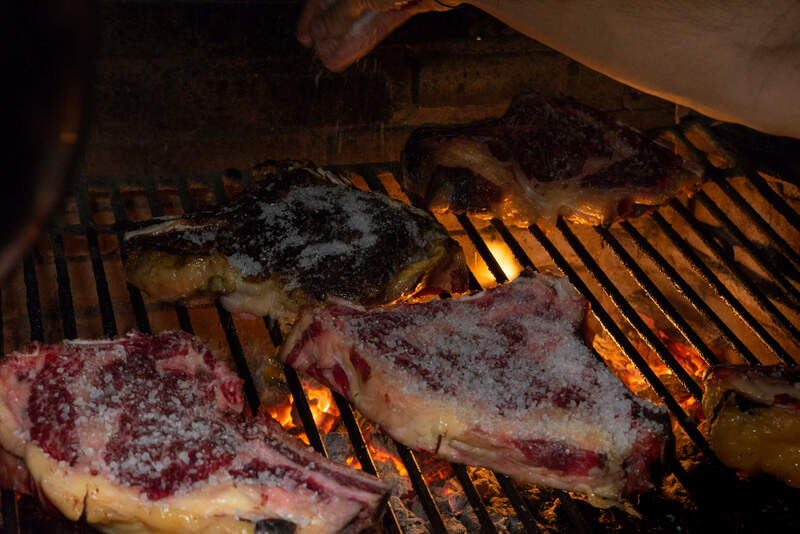 Such a great mission deserves a tribute, so the grill has an exceptional place in Tolosa. It presides over the hall of Casa Julián, becoming the real protagonist of the original steakhouse. It is a grill made of brick that acts as an oven and concentrates great temperature inside. It is walled up on three of its sides and has an exit to the outside in its upper part. With a powerful extraction that prevents the accumulation of smoke around it, it is a grid of rods with a lower charcoal pan and displays several degrees of inclination.. The grill and the roasting method are shared by the headquarters (Tolosa) and branches of Casa Julián (Cava Baja and Bulbiza, in Madrid). The meat is placed on the grill at room temperature and before roasting, it is further tempered on the grill away from the fire. When it is time to grill, direct contact with the fire is sought, after adding salt to cover its top surface. With the strong fire one seeks to seal the meat, always turning the chop with the top surface covered with salt. What is sought to seal the meat? This does not lose juices that are those that give the flavour. A good roast is noticeable on the plate because it does not release juices. The meat is served rare, with a golden toast, and with a hot interior, a temperature that is achieved with the previous tempering.